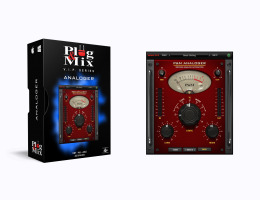 P&M Analoger brings the classic warmth and character of a tape machine to your studio. It allows you to mix in the sound of tape saturation and crunch from vintage tubes to get the sound of tape. Press the middle Selector button to get a mixture of both Tube and Tape processing. Use the big Drive knob to dial in pure vintage analog saturation. Move the Lows and Highs knobs to adjust the Low and High end of the signal. Conveniently a Mix knob is placed in the upper left corner to adjust the dry to wet ratio, as well as an overall Output knob on the right. Drive - Adds less or more tape and/or tube drive sound. Lows - Adds more low frequencies. Highs - Adds more high frequencies. Selector buttons - Choose between Tube, Tape or a mixed Tube-Tape sound. Mix - Dry/Wet Mix of the plug-in. Out - Controls the output level of the plug-in.